There is a pretty nasty story doing the rounds at the moment which if true is going to be a real pain for a whole lot of people. 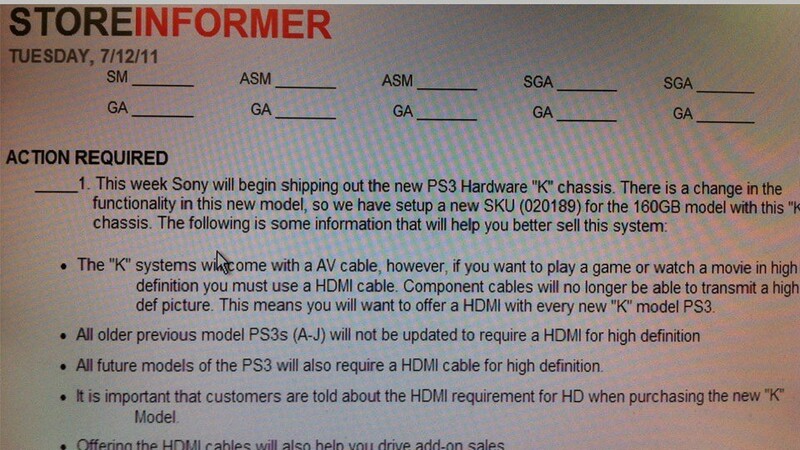 According to insider documents sent through to Kotaku Sony’s next console version, which is being shipped to retailers as you read this, will not be able to playback HD Movies or Gaming if you have your PS3 connected via anything other than HDMI cables. To try and clarify, currently you can view full HD (1080p) through component cables on your PS3 so that if like me you only have 2 HDMI ports on the back of your TV you can still ensure that your PS3 is fully HD enabled by cracking open those component cables. However the latest consoles will now disable HD output over anything other than HDMI cables. Apparently this is due to the final AACS adopter agreement which is something Sony has to abide by since it has a built in Blu-Ray player. The memo states that this disability will not affect older models but will affect all newer versions that appear in time. I’m a little worried they are going to patch my one to disable the HD output in the future but for now I’m safe and if they do then I guess I’m just going to have to move the Xbox to component and plug the PS3 in via HDMI instead. It’s not a train smash but it is disappointing that someone out there is forcing the HDMI standard when the cables are still so stupidly overpriced. At the time of writing Sony were yet to officially confirm or deny this memo but to be honest it’s a very odd hoax if it was one so I’m going to presume it’s true for now.